The ambidextrous TAC PRO® Kydex® adjustable M14 / M1A rifle Cheek Rest has been designed to provide perfect eye alignment with the sighting system without compromising functionality. 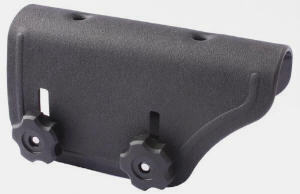 This cheek rest was designed with the aid of a former Israel Defense Force sniper who has had countless hours of operational experience on M14 rifles. The TAC PRO® adjustable cheek riser solves this problem with an ergonomic asymmetric shaped top design that does not increase the width of the stock where the cheek rests while providing height adjustment.